What Is A Quantity Surveyor? What Is A Quantity Surveyor? 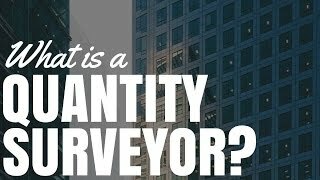 What is a quantity surveyor? What do they do and when do you need to hire them? What is a quantity surveyor? What do they do and why is it important to you as you’re building your property portfolio? Hey, I’m Ryan from onproperty.com.au, helping you find positive cash flow properties. I wanted to teach you today about exactly what a quantity surveyor does and when it’s going to be worth you hiring them. A quantity surveyor is someone who’s a specialist in the measurement and the estimation of construction cost. Now, this means that they’re really good at looking at plans of a property and working out how much concrete? How much steel? How many bricks? What is going to go into this property and how much is it going to cost? They’re also a specialist at looking at an existing property that’s already been built. Maybe it was built 20 years ago. They can assess it and say they used likely this many bricks, this much wood, this many tiles and how much would that have cost 20 years ago when that property was built. So they can estimate the cost of a property that’s going to be built. They can also estimate the cost of a property that has already been built. Now, why is this important to you? It’s important to you because when you’re investing in property, there’s a valuable tool called “depreciation”. Depreciation is the lowering in value of an item. The easiest example that I can give is when you purchase a car brand new – let’s say you paid $40,000 for a new car. You know that as soon as you drive that off the lot, it has lost value and is now worth 10% less or something like that. That loss in value is called depreciation. Every year, that car is going to get worth less and less and less and less. So a car that you might have paid $40,000 for 10 years ago, isn’t going to be worth $40,000 in 10 years’ time. It might be worth something like $10,000. So there’s a big difference between what you paid for it and what it’s worth now and that difference in value is what’s called “depreciation”. So a car you bought 10 years ago for $40,000 has depreciated $30,000 and is now worth $10,000 today. The reason this is important when you’re investing in property is that the ATO allows you to offset these depreciations and count them as a loss on your property. And with the current negative geared laws, which may change in the future, you can actually offset that against other taxable income that you’re earning. This is why it’s so valuable. Because if you’re a high income earner and you’re paying of tax, over 30%, high 30%, maybe even over 40%. If you can claim $10,000 in depreciation, there’s the possibility that you could get some of that back from the government or you don’t have to pay as much tax. And so, depreciation is very, very valuable because it can improve your cash flow because it lowers your cost – one of your major costs, and that is tax. Because you are claiming the loss in value of these items in the property, it just means that the property, on paper, isn’t making as much money because you’ve had all these depreciation losses. So this can be very valuable in terms of cash flow, in terms of giving you the extra cash that you need to be able to service more loans, buy more properties, pay for that next renovation, etc., etc. So depreciation’s not to be overlooked. I know there’s a lot of investors out there who invest and don’t do depreciation, but this is generally due to the fact that they’re uneducated about what depreciation is and why it’s valuable to them. A quantity surveyor is important because when it comes to depreciation, you can’t just do it yourself because the ATO – the Australian Taxation Office – won’t actually accept your opinion as an estimation of the cost of things in your home. For example, let’s say that I have these lovely curtains here that we bought from Ikea. I think we paid $5, $10 for a set of these curtains. What if I was to say that this was an investment property that I owned and I put these lovely curtains in and they are worth $1,000. I’ve lost the receipt so I’m pretty sure they’re $1,000. So I’m go to claim depreciation against my $1,000 curtains. Okay, that’s an extreme example, but that’s something that the ATO obviously wants to avoid. Because if I can claim depreciation on things that aren’t actually worth what I’m claiming them for, then I’m going to save a lot of tax, which means they’re going to miss out on a lot of tax and that’s tax evasion. So we’re going to want to avoid that. So quantity surveyors are experts in this and the Australian Taxation Office will take their estimates of what things are worth in your property as fact because these people work in the industry. They’re the experts at estimating how much things are worth, how much things cost, etc., etc. A quantity surveyor will go into your property and will estimate the cost of construction of the property itself. If your property is not too old, then there may still be depreciation you can claim there. They’ll also estimate the cost of the unfixed or the plant and equipment in your property. Things like your $1,000 curtains or things like the carpet, light fittings all this sort of stuff. They will estimate the value of those as well. They’ll then create what’s called a depreciation schedule. Everything depreciates at a different rate. If I put tiles in a property, they’re probably not going to go down in value as quickly as carpet, which is going to experience a lot more wear and tear. Curtains are going to wear out quicker than an oven that I put into my property. And so, I believe that there are guidelines or there are rules about what percentage of things you can depreciate and how long it takes to depreciate. So I may be able to depreciate the full cost of these curtains faster than I can depreciate the full cost of tiles or ovens or light fixtures or things like that. There’s a lot of different rules and then there’s extra rules that as things drop below a certain value, they go into this low value pool and that has its own rules as well. So it’s very complex and very difficult to do by yourself. And so, a quantity surveyor will prepare a depreciation schedule for you. You then take that depreciation schedule to your accountant and then they will use that depreciation schedule to claim depreciation for you when you go ahead and do your tax return. I say all of this and explain all of this to explain that a quantity surveyor is someone that assesses the value of your property, the building itself as well as the things inside that property and then provide you with a depreciation schedule that you can take to your accountant and you can use to save tax or to claim that depreciation. So, a quantity surveyor is someone that is very important to building your property portfolio. It’s not someone that you’re going to need to go and see every year, like you need to see your accountant every single year. It’s someone that you see once for the property. It’s only if you make major changes or updates to the property that you may need to go back to a quantity surveyor. The ideal time to get a quantity surveyor involved is at the very beginning of purchasing your investment property. If you failed to claim depreciation, I do believe you can claim backwards depreciation of about 2 years. However, it’s very difficult to claim depreciation further back than that. So if you’ve owned a property for 5, 10 years and you decide, “Oh my gosh, I missed out on 10 years of potential tax savings. I’m going to get a quantity surveyor and just fix that.” Well, no, you can’t necessarily do that. So the best thing to do is to get a quantity surveyor in as soon as you purchase the property. Get them to assess it and so, as soon as you’re doing your first tax return, then you’ve got the depreciation schedule. You can start claiming tax straight away. Now, I do believe if you get a good quantity surveyor mixed with a good accountant that there are ways to claim this depreciation and get the cash flow benefits on an ongoing basis. So rather than waiting until tax return time at the of the year and getting tax back from the government of thousands of dollars, you may be able to actually get that as a payment or as a tax saving that you don’t have to pay throughout the year. That can really improve your cash flow. I hope that this has explained what a quantity surveyor is, exactly what they do. We talked a little bit about depreciation and then we talked about when is the best to get a quantity surveyor and that is when you first purchase a property. Or, if you already own a property and you haven’t had a quantity surveyor do a depreciation schedule for you, then now is the time. The longer you wait, the less you can back claim. Because, obviously, time is always moving forward and it never moves back. I hope that his has helped explain it to you. I hope that you can find a good quantity surveyor to add to your arsenal of property experts that can help you. I have previously interviewed Brad from BMT Quantity Surveyors, who are the largest in the country. You can check them out at bmtqs.com.au. They basically do everywhere, all over the country. They’re not the cheapest, but they are the biggest and they can service everywhere. Look, I haven’t looked into it in detail as to see whether they’re excellent or not, but Brad was a really nice guy – really informative. I really understood what he was doing and so, truthfully, if it was me and I needed to get a quantity surveyor, BMT would be the first people I would get to quote. I’d probably get 2 other quotes, but I’d go to BMT first. You can check them out, go to bmtqs.com.au. If you’re interested in investing in property and you need a little bit of help getting over the line. Maybe you need someone to help you find a good area to invest in or help you inspect a property or just help you to negotiate and purchase your property. If that’s you, and you’re struggling to take that step and buy the property yourself, you want someone to hold your hand, then you may want a buyer’s agent. And I’m working very closely with Ben Everingham from Pumped on Property, who’s my buyer’s agent of choice and he is offering listeners of On Property a free strategy session with him to set goals for yourself and to also try and analyze how you can potentially achieve those goals through investing in property. So if you’re interested in a free strategy session to kick start your property portfolio and you need that little bit of extra help, then you go to onproperty.com.au/session to book in and request a free strategy session over there. Thanks to Ben for offering that. I hope that this episode has been helpful to you. I’m going to go through a whole bunch of different things that can be complicated to understand in property and try and explain them as best I can for you. Until next time, stay positive.